1. Installed with EURO II environmentally-friendly and energy-saving engines. 2. The main clutch which is adopted has been used in the Komatsu 180 Horsepower bulldozer, with such advantages as big torque reserve coefficient and long life. 3. The reducing throttle is equipped. 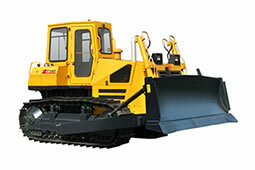 When the bulldozer is traveling in the downhill grade or bumpy ground, the speed can be well controlled to strengthen the safety of operation. 4. Sealed track shall be adopted. Seal ring is provided at both ends of the pin sleeve of the sealed track to prevent entry of silt and other grinding materials. 5. The joystick is adopted in the control device, which is light and flexible. 6. Alarm electronic alarm system is applied to the electric system to improve operation comfort and monitoring reliability and timeliness. 7. The ground contact of travel system is long to improve the adhesion force and make full use of engine power.